We got a nice mention in ABC 7 News! In addition to the incredible South Coast Plaza Shopping Center, visitors to Costa Mesa can get a truly inspired shopping experience at SOCO and The OC Mix. This shopping mecca will speak to the creative in anyone. It specializes in boutiques and retailers with offerings in home design, cooking, and so much more. It just may awaken your inner chef, interior designer, mixologist, or may even inspire a brand new hobby as well. Carlos Salgado doesn’t see borders. Or, rather, 2016 is the year he feels more comfortable crossing them. It’s something he does both literally and figuratively as one of the main flag-bearers of Alta California cuisine, a creation of Mexican American chefs in Southern California who, in the last few years, have been fusing the skills and techniques honed in California’s fine-dining kitchens with the flavors and pride of their Mexican roots. 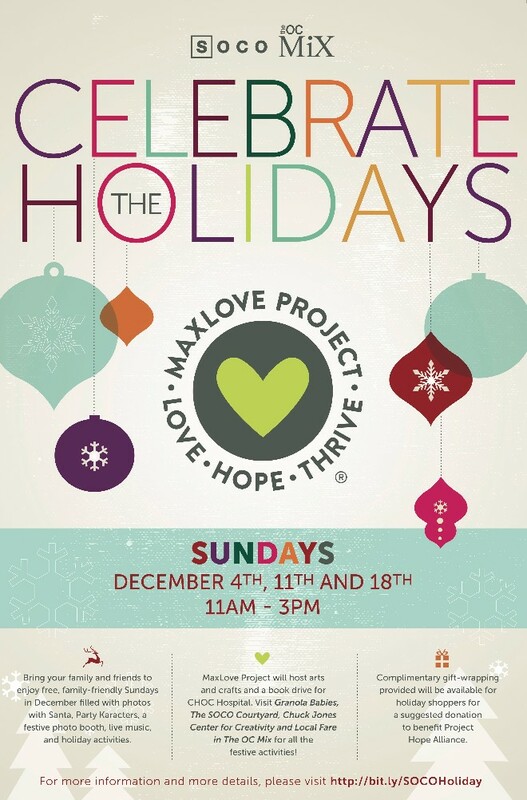 Celebrate the Holidays at SOCO & The OC Mix – This Sunday!